Surround yourself in beauty at Arenal Manoa Hotel. You will find Manoa a tranquil place to rest, relax and soak in the rejuvenating thermal waters while taking in the marvelous view of Arenal Volcano. Surrounded by tropical rainforest gardens and rolling pasture land with lots of birds, flowers and animals, this is the perfect spot to center yourself in the La Fortuna area. Close to all the activities, the rooms at Arenal Manoa have been designed so to give guests a panoramic view of the volcano. You can hike in the gardens, go bird watching, meditate or take a tour and see the daily operation of a typical Costa Rican farm. 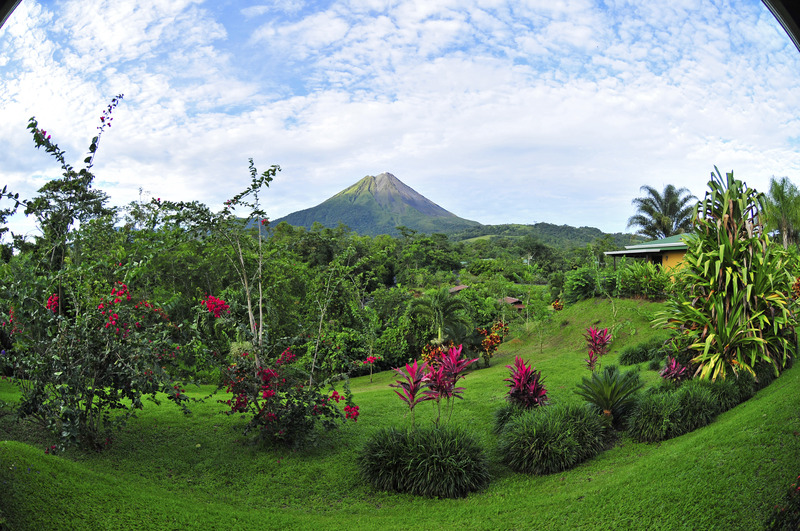 Each room has rocking chairs on the terrace so you can view Arenal Volcano and enjoy the comfortable temperatures. When you arrive, you will be greeted by a delicious tropical drink to welcome you to this charming property. Because Manoa is part of a working dairy farm, they allow guests to tour the farm and learn about the livestock raised on the property. The two-hour tour includes rubber boots, and you can see products utilized in the restaurant – milk, eggs and vegetables – giving guests a true farm-to-plate experience at Manoa. Rooms designed with individual terraces provide guests with a panoramic view of Arenal Volcano while they are at Manoa. Visit one of the many pools and Jacuzzis at Manoa, all positioned so you can enjoy the soothing water without missing a view of the volcano. There are natural hot springs and a children’s pool, plus a spa if you want to indulge and pamper yourself. Swedish massages, reflexology treatments, aromatherapy and hot stone massages, plus a variety of both body and facial treatments are offered at Manoa. Junior Suites have two queen beds, private bath, satellite TV, A/C, coffeemaker, hair dryer, safe, mini-fridge and personal care toiletries. Garden touches in bathrooms and rocking chairs on each terrace for volcano viewing. Free Parking, Free Wi-Fi, Swimming Pools, Laundry Service, Spa, Thermal Pools. Welcome Cocktail. Costa Rican and international cuisine with farm to table offerings.